SEONGNAM, South Korea, Oct. 12 (Yonhap) -- Police raided the home of Gyeonggi Province Gov. Lee Jae-myung on Friday in a probe into suspicions that he used his authority to forcefully institutionalize his estranged brother at a mental hospital and lied about the allegations during election campaign. Investigators from Bundang Police Station in the province also searched him, taking his mobile phone, as well as going through several offices in Seongnam City Hall, where he served as mayor. 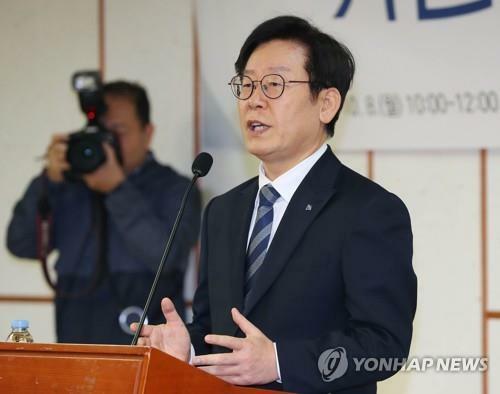 Lee, who is affiliated with the ruling Democratic Party, became the governor of the province surrounding Seoul after winning a heated election in June. Lee was also a contender at the party's presidential primary last year. The influential politician has long been dogged by allegations involving his family and extramarital affairs. In June, the minor Bareunmirae Party filed a complaint against him alleging that he used his mayoral power to have his brother, now deceased, hospitalized against his will and that he violated the election law by falsely denying the suspicion. The party also claimed he lied about his alleged affair with an actress during campaign, and pressured local companies to provide more than 16 billion won to the city-affiliated pro football team in the form of advertisement charges. Police said Friday's search was related only to the allegations about his brother. Separately, the actress, Kim Boo-sun has lodged a police complaint and lawsuit for defamation. The scandal took a fresh turn last week after a recorded phone conversation between Kim and a novelist went viral. Kim was heard saying that she knows Lee has a large mole on his body and that she could use it as a "smoking gun" in trial. Lee has flatly denied all allegations.